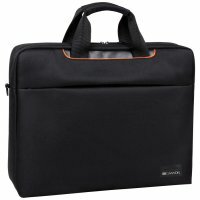 The Standard bag is a slim carrying solution which can fit most of 15-16” laptops. Quick-access pockets provide order, while hideaway carry handles and a detachable shoulder strap allow multiple carrying options. An innovative bottom pocket, separate from the laptop compartment, safely stores your charger and other accessories without the fear of damaging your device. Besides, this safe and lightweight bag allows you comfortable travel, it has grip handle for trolley suitcases which allows to fix it upon the trolley handle.